Jim Reffkin, with the support of the Tucson Parks & Recreation Department, has brought our Community Tennis Programs into national prominence. For over 30 years Jim has served as an innovative program developer, national speaker, author, writer, county construction consultant, coach, teacher and marketing director with a national reputation. He has been active in virtually every facet of the tennis industry. Jim is past president of the United States Professional Tennis Association, a USPTA Master Professional (one of only 100 in the country), and a college and high school coach with the finest won-loss record in the history of Southern Arizona tennis. In 1987, the International Tennis Hall of Fame awarded Jim the Education Merit Award, joining him with such well-known tennis celebrities as Arthur Ashe, Vic Braden, Dennis Van de Meer, Pam Shriver and Zina Garrison. His ambitious volunteer efforts to promote the game won him the USTA National Community Service Award in 1979. Jim has been president of the Southern Arizona Tennis Association, past president of the Southwest Pro Tennis Association, and former Southwest Professional of the Year. He is currently USTA Southwest vice president. In 1993, under his guidance, Randolph Tennis Center won the National Outstanding Tennis Facility Award and continues to be a model in the tennis industry. 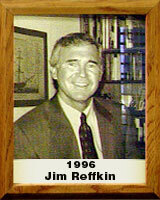 During his years as Director of Tennis for the City of Tucson, Jim Reffkin has brought a national focus to our community. Randolph now hosts more National USTA Championships than any other facility in the U.S.